The yahoos at Apartment Therapy ran a feature the other day about hanging mosquito netting over a bed or reading look to lend a pretty, soft, outdoors-y touch to your home. Pah! Here were their suggestions, though I found some different photos to better illustrate the absurdity of this idea. Hang mosquito netting over a four-post bed to accentuate the space it encloses. Circle just the crown of the bed with a smaller round canopy, as in this airy bedroom. Establish gauzy "walls" for an outdoor dining room. Canopy a lounge area to stay bug-free when hanging out this summer. Create a mystical reading nook simply by enclosing a small area with mosquito netting and placing a floor cushion inside. Mosquito nets can't be made pretty or cool no matter who's advancing them. If you live in a place where you need one, any of the set ups shown here or on the AT feature won't help you. This kind of mindlessness drives me nuts. According to the World Health Organization, 247 million people worldwide contracted malaria in 2008 and a million of them died. The chief preventive for malaria is the humble mosquito net and those million deaths were caused by a lack of access to one. 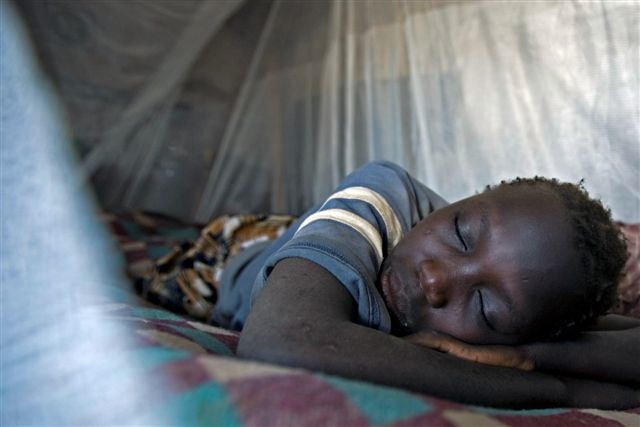 Malaria's not such a problem in the developed world that people need to sleep under nets. In the tropical developing world, it's another story all together. Here's an idea. 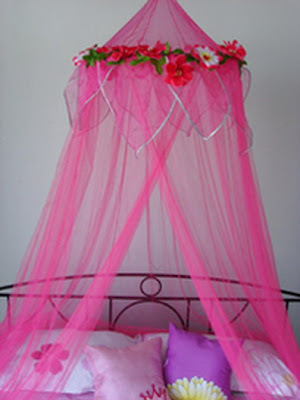 If you're overcome with the need to drape a mosquito net canopy over your bed, stop. Instead of spending that money on a bad idea, why not donate it to Malaria No More? Malaria No More will take a ten dollar donation from you and get a mosquito net into the hands of someone whose life depends on it. Seriously, can anybody look at these photographs and say to themselves, "Self, let's do that!" Save yourself the public shaming and turn that urge into something positive. Once again, that website is Malaria No More. This is the proper use of a mosquito net, saving a life. The same people who think that a mosquito net is a fashion accessory are cast from the same brain pool as those who believe we should be making fuel out of food, corn. Makes no sense. Actually, the corn ethanol thing is worse and crosses the line into being immoral. I don't know if it's a national buy or just along the Gulf Coast, but the corn ethanol people have wasted no time in capitalizing the spill and we've been assaulted by a non stop parade of ethanol TV ads for the last week. Talk about jumping from the frying pan and into the fire. "Hey kids! let's take an artificially cheap food crop out of peoples' mouths and put into their gas tanks! Who cares if people go hungry!" Ugh. Reason #432 why you rock, Paul. Hah! Thanks Raina. I do have to admit a particular fondness for photo number three. Hah! Cue the unicorn! I think she likes unicorns too. As any chaste innocent should. I thought about that early this morning. "Self," I thought to myself, "Better gird your loins for battle with Madame Sunday." Bring it. Some of these look sort of cute for a little girl's room... is that so wrong? And if that isn't wrong, is it wrong that I might want one for a little while to process my feelings of never getting a canopy bed that I wanted when I was a child? I had the full white provincial suite from Sears with the 4-poster bed and everything, but I got a little sister to share my room with instead, and she took up too much space. Can I rent something like this, you know, just to get over it and move on? Or shall my princess desires manifest themselves in other ways? Help me please! Hmmmmm. Perhaps you could carry around a scepter and issue decrees? 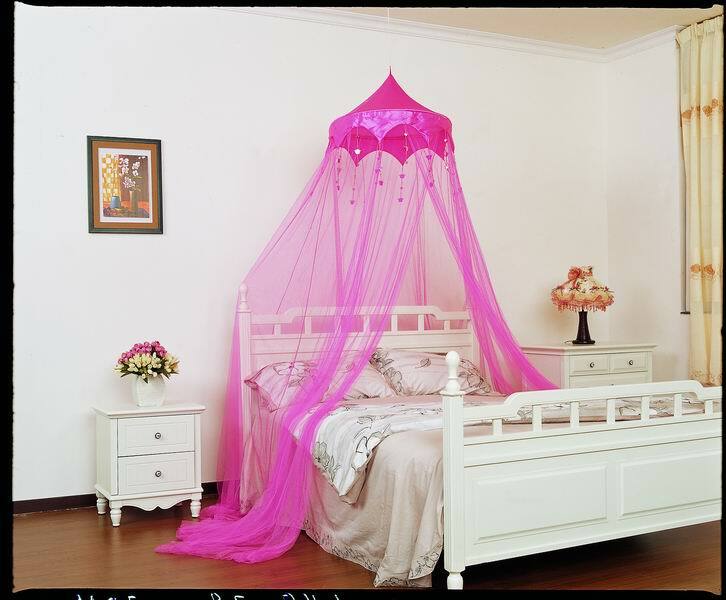 I would like to note that while the frilly pink sort of mosquito net is not welcome in my household, the real thing could be. It's a matter of function since Texas has some pretty big mosquitoes. hmmm...sorry, just saw the sentence particularly calling out the non-functionality of these pieces. Sorry to disappoint but trying to fake an experience always looks dumb. Once something makes it to Bed, Bath and Beyond it pretty much loses all sense of exotic fantasy for me - if it ever had any to begin with. Bars over windows also probably saves lives to but I don't see many people adding them to their exteriors for that authentic ghetto feeling. I guess if you're 6 these are ok... but I don't have to like it. But now what do I make my mystical reading nook with? Maybe you can borrow Katerina's scepter. Ha! I had to do some real talking to get my aunt not to buy this netting from IKEA a couple of weekends ago. She thought she was a design genius for wanting to use it over her two little girl's beds. Luckily I won....for now! Anybody want to call out some current bad trends? When did ping pong tables get hip? Get me to Puerto Rico STAT! How big's that spill again? What's in a Magic Eraser?